Sounds a little oxymoronic, no? Isn't the whole point of being healthy NOT to indulge, and the whole point of indulging NOT to be healthy? My answer to that question is: not if you have a little creativity running through you. I made a special “bar food” meal the other day for dinner of oozy-cheesey quesadillas, crunchy-crispy onion rings and fizzy-sweet soda. And it was one of the healthiest meals we ate all week! Corn tortillas, which are naturally low in fat and have fiber, rather than flour tortillas, which nearly always contain shortening. I wanted to use the big corn tortillas to make half moon quesadillas (easier in my opinion) but couldn't find them and had to use the smaller ones in the sandwich quesadilla method. Cheddar cheese and gouda cheese, shredded by me in ten seconds with the cheese grater wheel in the food processor. And I found both blocks at 75% reduced fat, and they still tasted great. Filling the quesadilla with lots of fresh arugula and previously-sauted mushrooms in a little nonfat canola spray, salt and pepper. This fills the quesadilla with some healthy veggies rather than meat or more cheese. No oil or butter in the quesadilla pan. Nonfat spray is fine – the cheese will provide all the oil needed. I am going to work on making these in the oven and still have them turn out crispy and golden. 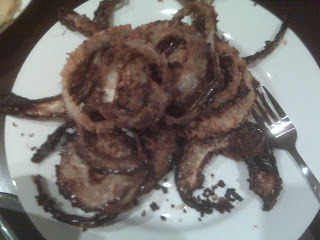 I found a recipe for whole wheat, oven-baked onion rings, which I followed pretty closely. Here's a link to it. It used kettle potato chips as the crunch. And I found some magnificent ones reduced fat ones that were very low in fat and saturated fat, as well as sodium. They had plenty of potassium, fiber and protein, and tasted great. It also called for whole wheat flour, skim milk, white vinegar, pepper and nonfat canola spray – nothing that will come close to killing your diet. Best of all, they came out of the oven all dark and crispy and ready to be salted and enjoyed guilt-free. While I know I didn't come up with this recipe, this is an example of how I use the Internet to help me. Especially in cases where I'm trying a non-traditional take on a traditional recipe (like baked onion rings), it is good to see if others have tried it and succeeded. In this case, this one looked so unique, easy and delicious, that I couldn't help but try it and share it and my quesadillas with you.